The struggle between life and death is the fundamental responsibility of the Emergency Medical Services (EMS) professional; EMS systems provide a medical safety net for the public. Since the inception of the EMS profession, paramedics have received billions of calls from Americans in need of emergency care. Each one of these calls generates a complex chain reaction that started in the 1960s. In the early 1970s, paramedics first appeared in the public eye when the series Emergency appeared on television. However, the development of the paramedic profession predates the television program by several years. Before the 1960s, funeral home personnel were a major source of care given the sick and injured with the first ambulances doubling as hearses. Only a small number of ambulance services existed; and of these, only a few employed properly trained attendants. With the resurgence of mouth-to-mouth resuscitation in the 1950s and discovery of closed-chest cardiac massage in the 1960s, cardiopulmonary resuscitation (CPR) became available to professionals and lay persons. Consequently, public interest grew in the ambulance industry, and more people looked toward a career in the EMS profession. In 1966 the National Academy of Science published a report entitled Accidental Death and Disability: The Neglected Disease of Modern Society. This paper shaped the future of the EMS profession by showing that trauma care could reduce morbidity and mortality. About the same time, Congress passed the Highway Safety Act of 1966. From this Act, the Department of Transportation (DOT) was created. The DOT improved EMS systems by designing and implementing standards for the training of all EMS providers. Additionally, Congress passed the Emergency Medical Services Act of 1973, making federal funds available to regional and local communities to develop EMS programs. With federal funds available, EMS systems grew dramatically in the 1970s. Since the 1990s EMS professionals have become part of a complex multifaceted Emergency Medical Service System nested with the overall health-care system. EMS systems are "planned configurations of community resources and personnel necessary to provide immediate medical care to patients who have suffered sudden or unexpected illness or injury" (Henry and Stapleton 1992, p. 4). The attributes of EMS systems include integration of health services, legislation and regulation, system finance, human resources, medical direction, education systems, public education, prevention, public access, communication systems, clinical care, information systems, and evaluation. Many different levels of Emergency Medical Technicians (EMTs) exist in the United States; however, the DOT recognizes only four levels: first responder (FR), EMT-basic (EMT-B), EMT-intermediate (EMT-I), and EMT-paramedic (EMT-P). The EMT-B is the basic EMT level and provides skills such as CPR, bandaging, splinting, oxygen administration, and automatic external defibrillation. The EMT-intermediate (EMT-I) receives additional training beyond that of the EMT-B to include advanced airway and cardiac pacing. The paramedic (EMT-P) is the most skilled and, of all the EMTs, provides the most advanced prehospital care. First responders are the first individuals to arrive at the scene. First responders have a variety of credentials and function as assistants to other EMTs. During an emergency response, EMTs receive their medical direction from local emergency room physicians and previously established protocols. The federal government provides standard curriculums for EMS professionals; however, each state sets the practice regulations and training standards for the different levels of EMS providers. Training standards did not exist until 1971, when the DOT published the first EMT national curriculum. The DOT approved the EMT-paramedic curriculum in 1976 and the EMT-intermediate curriculum in 1985. 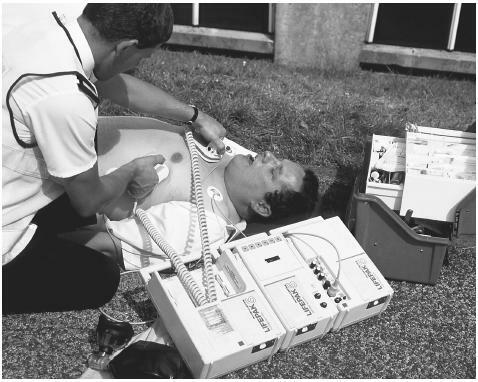 In general, the 1970s were an era of expansion for EMS training. Currently, the DOT is moving away from standardized curriculums and specific lesson plans to a more comprehensive and flexible education model. This model will use a less prescriptive method yet still employ a systems approach to integrate the following components: core content, scope of practice model, education standards, EMS certification, and education program accreditation. Attempting to save a heart attack victim, this paramedic uses a defibrillator machine that applies an electric shock to restore a regular heartbeat. by rapidly and safely treating and transporting the sick and injured. All EMS professionals must face death. The need for coming to terms with death is universal; death is part of an EMT's everyday duties. These professionals must not only learn how to respond to death, but also how to react to it and integrate it into everyday life. EMS professionals employ several strategies to control the stressful effects of death. The most frequently used defense mechanisms are educational desensitization, humor, language alteration, scientific fragmentation, escape into work, and rationalization. Many paramedics, when asked about their role, will respond that they hope to truly make a difference. One of the personality features common to EMS professionals is altruism. Altruism provides them a special spot in the hearts of most Americans. "Always ready to serve others in time of need, the paramedic has become a most respected person in contemporary America" (Page 1979, p. 49). The second challenge for EMS providers is the public perception of paramedics as lifesavers. Most of society anticipates that a paramedic will save the life of their loved one. Television programs such as Emergency and Rescue 911 perpetuate these views by portraying paramedics as lifesaving heroes, as robbers of death. As the medical community increases the chances of surviving death, the public will expect the EMS profession to provide similar results. Third, the primary death-related training afforded to EMS professionals is often inadequate. EMS programs train paramedics to recognize the technical aspects of death with only a minimal amount of instruction covering the psychological or social aspects of death. Furthermore, this training often does not cover helping families at the moment of death or issues unique to prehospital death. The National Curriculum for Paramedics provides only a few grief-related objectives based on Elisabeth Kübler-Ross's stages of dying. There are no objectives specific to making death notifications or handling postmortem arrangements with newly bereaved persons. Because paramedics receive limited training in cultural and religious sensitivity, cultural and religious diversity further hinder a paramedic's ability to provide immediate support to the bereaved. The paucity of training may contribute to paramedics who feel that conversations with bereaved persons are problematic, stressful, and uncomfortable. Furthermore, conversations with bereaved persons may be harder for paramedics who have not come to terms with their own mortality. The prehospital environment in which EMS professionals practice creates many obstacles during incidents involving death. When EMS professionals respond to an emergency, they request the right of way with their lights and sirens; consequently, they increase the risk for accidents and injury. After arriving on scene, EMTs provide care with limited equipment (compared to hospitals), with the public looking on, in adverse weather conditions, in hostile environments, and at all hours of the day and night. It is a formidable task to resuscitate a patient under these circumstances, yet EMTs do this every day as a routine part of their daily work. Death from AIDS and SIDS or deaths involving young children, coworkers, and other public service professionals (e.g., police officers) also aggravate the stress associated with responding to a death. Legalities surrounding death also pose hurdles for EMTs. In the 1980s the greatest legal challenge for the EMS community was determining when to start CPR. This issue challenged not only the EMS profession but also the medical community as a whole. Initially, EMS providers started resuscitation on all patients, even if this conflicted with the patient's wishes or the personal views of the paramedic. For example, in the early 1980s, many terminally ill patients went home to die, but when the family called the paramedics to pronounce death, the paramedics arrived and resuscitated the patient. The lack of Do Not Resuscitate (DNR) protocols required EMTs to do their best to bring these patients back to life. This duty often came at an emotional expense to the EMTs who responded to the incident, as well as to the families of the victims. By 2000 every U.S. state had its own Do Not Resuscitate protocol for EMTs. Despite these protocols, EMTs still resuscitate terminally ill patients. Many terminally ill patients are unaware of their local EMS agencies' policies to not recognize living wills and require official EMS-DNR forms. In the early 1990s most EMS systems were challenged to create new guidelines for EMS providers detailing when to stop CPR and other resuscitative actions. Despite common social belief, most cardiac-arrest patients die. The medical community now recognizes the enormous impact of cardiac-arrest patients on the health care system. These patients require precious EMS resources, often at the expense of other less critically ill patients. Through research and experience, doctors can identify which patients are viable patients and separate them from patients with no chance of survival. Paramedics declare death and stop CPR on the nonviable patients while still providing the most aggressive treatment for those patients who may have a chance to survive. Pronouncing death, EMS professionals provide the initial psychosocial support for newly bereaved families. Providing this support and mitigating the traumatic effects of death to the families is another area where EMS professionals truly make a difference. Boyd, David R., Richard F. Edlich, and Sylvia Micik. Systems Approach to Emergency Medical Care. East Norwalk, CT: Prentice-Hall, 1983. Henry, Mark C., and Edward R. Stapleton. EMT: Prehospital Care. Philadelphia: W.B. Saunders, 1992. Kuehl, Alexander E., ed. EMS Medical Director's Handbook. St. Louis, MO: C. V. Mosby, 1989. Jones, Shirley, Al Weigel, Roger D. White, Norman E. McSwain, and Marti Brieter Advanced Emergency Care for Paramedic Practice. Philadelphia: J. B. Lippincott, 1992. Norton, Robert L., Edward A. Bartkus, Terri A. Schmidt, Jan D. Paquette, John C. Moorhead, and Jerris R. Hedges. "Survey of Emergency Medical Technicians' Ability to Cope with the Deaths of Patients During Prehospital Care." Prehospital and Disaster Medicine 7 (2000):235–242. Page, James O. Paramedics. Morristown, NJ: Backdraft Publications, 1979. Palmer, C. Eddie. "A Note about Paramedics' Strategies for Dealing with Death and Dying." Journal of Occupational Psychiatry 53 (1983):83–86. Smith, Tracy L., and Bruce J. Walz. "Death Education in U.S. Paramedic Programs: A Nationwide Assessment." Death Studies 19 (1995):257–267. United States Department of Transportation, National Highway Safety Administration and United States Department of Health and Human Services, Health Resources Administration, Maternal and Child Health Bureau. Emergency Medical Services Agenda for the Future. Washington, DC: Author, 1996. United States Department of Transportation, National Highway Safety Administration and Department of Health and Human Services, Health Resources Administration, Maternal and Child Health Bureau. Emergency Medical Technician–Paramedic: National Standard Curriculum (EMT-P). Washington, DC: Author, 1996. Walz, Bruce J. Introduction to EMS Systems. Albany, NY: Delmar, 2002.